Rory McIlroy on the practice green yesterday. THE STRONG WIND blowing yesterday across Royal St George’s was just another sign that the moonscape masquerading as a golf course on the English coast would offer a vastly different test than the one Rory McIlroy solved so easily at the US Open. The British Open can be a puzzle of its own, as McIlroy found out last year when he followed an opening 63 with a big fat 80 when the wind started howling at St Andrews. He was too young, it was too early, and someone else got their name on the claret jug. Then came four days at Congressional Country Club that made people forget Tiger Woods isn’t playing much golf these days. Now comes a week that might tell us as much about McIlroy as he found out about himself at the US Open. A week that could answer the question of the past month: Just how good can McIlroy be? We already know the kid is the real thing. He proved that by taking a victory lap around Congressional on the final Sunday in an eight-shot rout that brought back visions of the way Woods used to toy with fellow competitors. But will McIlroy win major championships in bunches? Will he dominate over time the way he dominated a few weeks back? History suggests not. Players who are truly great come along only once every era, and this era already has one. Sitting in a packed interview room yesterday, though, McIlroy suggested yes. “All I need to do is focus on my game, and, if I can do that, I know my good golf is good enough to win plenty more tournaments,” he said. That no one doubts. McIlroy’s swing is a beauty reminiscent of other times, and his putting is good enough to carry him if that lets him down. Whether it will happen this week is another matter. Although British bookmakers have made McIlroy a prohibitive favorite, only six players have won both the US Open and British Open in the same year in the long history of both championships. Erasing the inevitable hangover that comes from victory might be the hardest part for McIlroy. Unlike McDowell, though, McIlroy seemed to be building for his big win long before it happened. He was in contention at three majors before finally breaking through, learning some painful lessons that served him well when he was poised to win his first major title at the US Open. He has led seven of the eight rounds of the two major championships so far this year, and managed to come back from a final round collapse at the Masters to lap the field at Congressional. Like a fighter who gets better after he wins a title, McIlroy believes he will be better now that no one’s asking when he will win his first major. It’s hard to find anyone rooting against McIlroy adding that second major. The unassuming 22-year-old with a mop of curls has a connection with fans that even Woods would envy, and he brings excitement to a sport that has been badly missing it ever since Woods crashed his SUV one fateful Thanksgiving night. “The thing about Rory is that he plays golf with a real flair and a real charisma, and I think fans are drawn to that,” Phil Mickelson said. McIlroy did the kind of things you’d expect after winning the US Open, watching some tennis courtside at Wimbledon and watching ringside as Wladimir Klitschko beat David Haye in a heavyweight title fight in Germany. McIlroy didn’t pick up a club for 10 days but has spent the last 10 days making sure his game is in order for a golf course that will play fast, firm — and hard. On his final night at home, he took his dad out for a late nine holes, the same thing he did before he went to St. Andrews last year and opened with a 63. It was the kind of round the two would play together while McIlroy was growing up. Refreshed and recharged, McIlroy is ready to make some new memories. He’s not afraid of the spotlight, and he seems to embrace the pressure. Soon we’ll find out just how big a star he will be. Email “Question now is how good will Rory McIlroy be? ”. 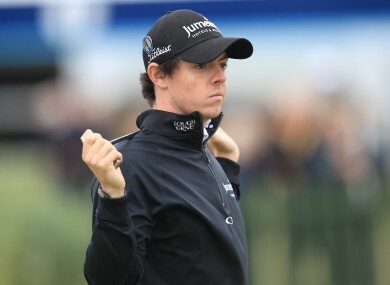 Feedback on “Question now is how good will Rory McIlroy be? ”.